The stalker with a hook for a hand. The old witch in the woods. The giant alligator in the sewers. Horror stories pervade modern culture, springing from myths, folklore, conspiracy theories and urban legends. But what if these stories were true? What if these imaginary monsters were real? What if they stalked the world and preyed upon humanity? What if you could face them? 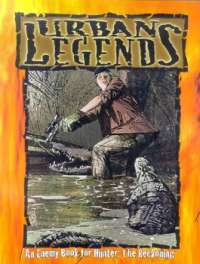 Urban Legends offers whole new possibilites for Hunter: The Reckoning as the creatures of modern and ancient myths are explored as hunter foes. The limits of the Storyteller System are tested as bizarre creatures from other games and beings never portrayed before in the World of Darkness emerge to perplex, plague and terrify the imbued. This is the ultimate scary story for Hunter.